در سال ۱۹۲۱ در سن ۱۸ سالگی خاچاطوریان به مسکو نقل مکان نمود و به برادر بزرگترش سورن ملحق شد. خاچاطوریان در روز ۱ مه ۱۹۷۸ کوتاه مدتی پس از تولد ۷۵ سالگی اش در مسکو درگذشت. در روز ۶ مه در پانتئون کومیتاس در ایروان به خاک سپرده شد. Bakst, James (1977). "Khachaturyan". A History of Russian-Soviet Music (Reprint ed.). Westport, Connecticut: گروه انتشاراتی گرینوود. ISBN 0-8371-9422-9. Chebotaryan, Gayane (1969). Полифония в творчестве Арама Хачатуряна [Polyphony in Aram Khachaturian's Works] (به روسی). Yerevan: Hayastan Publishing. OCLC 9225122. Geodakyan, Gevorg (1972). Арам Хачатурян [Aram Khachaturian] (به روسی). Yerevan: Armenian SSR Academy of Sciences Press. Karagiulian, E. (1961). Симфоническое творчество А. Хачатуряна [Symphonic Oeuvre of A. Khachaturian] (به روسی). Yerevan: Armgosizdat. OCLC 25716788. Kharajanian, R. (1973). Фортепианное творчество Арама Хачатуряна [Aram Khachaturian`s piano music] (به روسی). Yerevan: Hayastan Publishing. Khubov, Georgii (1939). Арам Хачатурян. Эскиз характеристики [Aram Khachaturian. Sketches of characteristics] (به روسی). Moscow: Gosudarstvennoe muzykal'noe izdatel'stvo. OCLC 29138604. Khubov, Georgii (1967). Арам Хачатурян:монография [Aram Khachaturian: monography] (به روسی) (2nd ed.). Moscow: Muzyka. OCLC 4940007. Robinson, Harlow (2013). "The Caucasian Connection: National Identity in the Ballets of Aram Khachaturian". In Kanet, Roger E. Identities, Nations and Politics After Communism. روتلج. pp. 23–32. ISBN 978-1-317-96866-5. Rybakova, S. (1975). Арам Ильич Хачатурян: Сборник статей [Aram Khachaturian: Collection of articles] (به روسی). Moscow: Sovetsky Kompozitor. Tigranov, Georgiĭ (1978). Арам Ильич Хачатурян: очерк жизни и творчества [Aram Khachaturian: Outline of Life and Work] (به روسی). Leningrad: Muzyka. OCLC 8495433. Tigranov, Georgiĭ (1987). Арам Ильич Хачатурян [Aram Ilʹich Khachaturi︠a︡n] (به روسی). Moscow: Muzyka. OCLC 17793679. Grigoryan, Armine (2012). Shahmanyan, Anahit, ed. Album: Aram Khachaturian. Aram Khachaturian Museum, Ministry of Culture of RA. Yerevan: "Krunk" Publishing. Avetisyan, Nelly (2014). Grigoryan, Armine, ed. 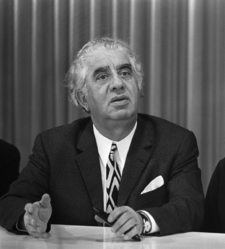 Aram Khachaturian and The Contemporary World. Aram Khachaturian Museum, Ministry of Culture of RA. Yerevan: "Amrots Group", "Tigran Mec" Publishing. ISBN 978-99941-31-80-8. 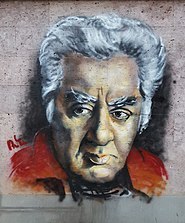 "Aram Khachaturian". The Complete Classical Music Guide. London: دورلینگ کیندرزلی. 2012. p. 301. ISBN 978-1-4654-0134-2. Blackwood, Alan (2013). "Aram Khachaturian". In Stacy, Lee; Henderson, Lol. Encyclopedia of Music in the 20th Century. Abingdon, Oxon: روتلج. p. 341. ISBN 1-57958-079-3. Geodakyan, Gevorg (1979). "Խաչատրյան Արամ [Khachatryan Aram]". Soviet Armenian Encyclopedia Volume 5 (به ارمنی). Yerevan: Armenian Encyclopedia Publishing. pp. 18–20. Lebrecht, Norman (1996). "Aram Khachaturian". The Companion to 20th-century Music. New York: دا کاپو پرس. p. 183. ISBN 978-0-306-80734-3. McCollum, Jonathan; Nercessian, Andy (2004). "Aram Khachaturian". Armenian Music: A Comprehensive Bibliography and Discography. Lanham, Maryland: Scarecrow Press. pp. 95–96. ISBN 978-0-8108-4967-9. Petrak, Albert M., ed. (1985). "Khachaturian, Aram Ilyich". David Mason Greene's Biographical Encyclopedia of Composers (1st ed.). Garden City, New York: Reproducing Piano Roll Foundation. pp. 1329–30. ISBN 978-0-385-14278-6. Randel, Don Michael, ed. (1996). "Khachaturian, Aram Il'yich". 9780674372993#v=onepage&q=Khachaturian%2C%20Aram%20Il'yich&f=false The Harvard Biographical Dictionary of Music Check |url= value (help). Cambridge: انتشارات دانشگاه هاروارد. p. 445. ISBN 978-0-674-37299-3. Rosenberg, Kenyon C. (1987). "Khachaturian, Aram". A Basic Classical and Operatic Recordings Collection for Libraries. Metuchen, New Jersey: Scarecrow Press. pp. 111–112. ISBN 978-0-8108-2041-8. Tomoff, Kiril (2006). Creative Union: The Professional Organization of Soviet Composers, 1939-1953. Ithaca, New York: Cornell University Press. pp. 34–35. ISBN 978-0-8014-4411-1. Chebotaryan, Gayane (1963). Արամ Խաչատրյան (Ծննդյան 60-ամյակի առթիվ). Patma-Banasirakan Handes (به ارمنی). Yerevan: فرهنگستان ملی علوم ارمنستان (3): 109–114. Ehrenburg, Ilya; Khachaturian, Aram; Pomerantsev, V. (1954). "Three Soviet artists on the present needs of Soviet art". Soviet Studies. روتلج. 5 (4): 412–445. doi:10.1080/09668135408409919. Frolova-Walker, Marina (Summer 1998). ""National in Form, Socialist in Content": Musical Nation-Building in the Soviet Republics". Journal of the American Musicological Society. انتشارات دانشگاه کالیفرنیا on behalf of the American Musicological Society. 51 (2): 331–337. doi:10.2307/831980. JSTOR 831980. Ter-Ghazarian, Zara (1983). Ա. Խաչատրյանի "Մակբեթ" ներկայացման պարտիտուրը [The score of A. Khachaturian's play "Macbeth"]. Lraber Hasarakakan Gitutyunneri (به ارمنی). Yerevan: Armenian Academy of Sciences (6): 23–28. ISSN 0320-8117. Tigranova, Irina G. (1970). Արամ Խաչատրյանի ոճի մի առանձնահատկության մասին [About a Certain Particuliarity of Aram Khachatourian's Style]. Lraber Hasarakakan Gitutyunneri (به ارمنی). Yerevan: Armenian Academy of Sciences (1): 26–35. Holland, Bernard (14 October 2003). "Khachaturian Beckons With Little-Known Works". نیویورک تایمز. Huizenga, Tom (5 June 2005). "The 'Sabre Dance' Man". ان‌پی‌آر. Archived from the original on 17 March 2014. Pritsker, Maya (5 October 2003). "What Could Khachaturian Do Besides An Encore?". نیویورک تایمز. در ویکی‌انبار پرونده‌هایی دربارهٔ آرام خاچاتوریان موجود است. Ware, H. Joseph. "Aram Khachaturian". Russia's Periphery. کالج ویلیام و مری. Archived from the original on August 14, 2014. Barinov, Aleksey (5 June 2003). "Мистер танец с саблями [Mister Sabre Dance]". Argumenty i Fakty (به روسی). Kocharova, Anna (6 June 2003). "100 лет автору "Танца с саблями" [100th anniversary of the author of the "Sabre Dance"]" (به روسی). Moscow. BBC Russian Service. Suchý, Ondřej (24 February 2007). ""Танец с саблями" по-чешски [The "Sabre Dance" in Czech]" (به روسی). Radio Prague. ↑ "Khachaturian". Collins English Dictionary Complete & Unabridged 10th ed. 2009. ↑ "Khatchatourian, Aram (1903–1978)". Bibliothèque nationale de France. Xačatryan, Aram (1903–1978) forme internationale translit.-ISO arménien . ↑ "Aram Khachatryan 110-Anniversary Celebrations Committee Holds Meeting". Government of the Republic of Armenia. 27 March 2013. ↑ "110th anniversary of Aram Khachatryan celebrated in Yerevan" (6 June 2013). Armenpress. ↑ "Հայ մեծերի դիմանկարները՝ Երևան քաղաքի պատերին" (به ارمنی). Yerkir Media. 25 July 2015. ↑ Geodakyan 1979, pp. 18–19. ↑ ۷٫۰ ۷٫۱ "Titles, prizes, awards". Virtual Museum of Aram Khachaturian. Archived from the original on 13 March 2014. ↑ خطای یادکرد: خطای یادکرد:برچسب <ref>‎ غیرمجاز؛ متنی برای یادکردهای با نام mosconsv وارد نشده‌است. (صفحهٔ راهنما را مطالعه کنید.). ↑ Geodakyan 1979, p. ۱۸.